Aston Villa threatened to blow Blackpool away early on in this encounter, but in a game that ebbed and flowed a share of the spoils was probably what both sides deserved. Villa threatened often with their lightning pace on the break, but ‘Pool may be a little disappointed that they were unable to break Villa’s resolve, especially after they were reduced to ten men with the dismissal of Jean Makoun. The Seasiders grew stronger as the game went on, but ultimately never looked like finding the elusive winning goal. In terms of how the two teams lined up, it was a meeting of minds with the two managers fielding similar 4-2-1-3 systems. After a tough couple of weeks for Neal Eardley, Alex Baptiste was moved to right back with the fit-again Craig Cathcart partnering Ian Evatt in the heart of the ‘Pool defence. Elsewhere Ian Holloway freshened up his attack bringing back Luke Varney and Marlon Harewood in favour of the two new signings Jason Puncheon and James Beattie. The average formation position diagram below sheds some light on how well the two teams kept to their respective systems. Blackpool’s average position chart is fairly standard, with perhaps only Luke Varney (16) not quite where you’d expect him to be. Varney’s performance was an improvement on the ones that led to him being rested, but still wasn’t at the level we saw earlier in the season – Holloway would surely like to see him higher up the pitch. Varney will also be disappointed with his header wide shortly after Blackpool’s equaliser. Varney’s average position may be explained partly however by the necessity to help our David Carney (29), who was often caught out of position early on. The chart above also shows the pressure ‘Pool’s full-backs had to endure, Gabriel Agbonlahor (11) and Stewart Downing (6) pushing right up. With Ashley Young (7) roaming in the hole behind Darren Bent (39, hidden behind Ashley Young on the diagram) the Blackpool defence had their work cut out, but can take heart from how they did adapt to largely nullify this threat in the second half. For the first 20 minutes though, Blackpool were being cut open, despite the equaliser from Elliot Grandin and Varney’s near miss at the other end. Villa’s main tactic was to get the ball wide to Agbonlahor and Downing (and also Young, occupying the ‘central winger’ role) and attack at pace. The chalkboard below illustrates this point, with Aston Villa’s passes for the first 20 minutes on the top chalkboard, and Blackpool’s passes on the lower chalkboard. In contrast to Villa’s use of width on both flanks, ‘Pool appeared to focus solely on the right in the opening stages of the first half, with Carney and Varney seeing very little of the ball. The Blackpool full-backs Baptiste and Carney both found themselves overrun in this period, with Baptiste out of position for Agbonlahor’s goal. Villa also had more of the possession in this spell, managing 69 successful passes to ‘Pool’s 47. Fortunately ‘Pool did finally settle down and began to assert their influence on the game, but were grateful for a Richard Kingson save from Downing as well as the upright which the former Middlesbrough man shaved with a separate strike from outside the area on 31 minutes. After the break it was the Seasiders who took hold of proceedings, having the better of the possession and the goalmouth action. 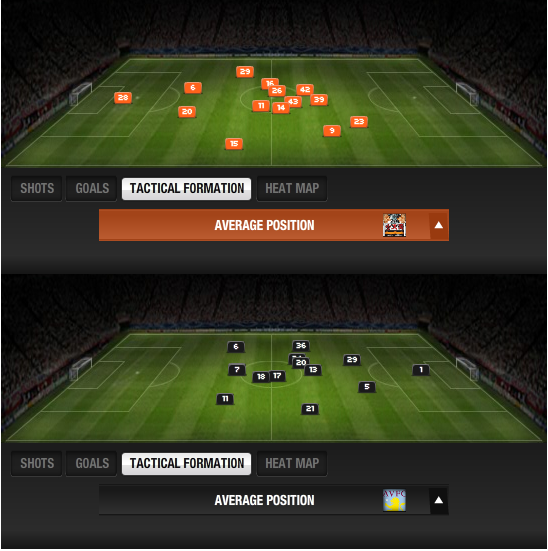 Blackpool completed 148 passes to Villa’s 86, but it was in the shots department where the difference was most obvious. As the chalkboard below shows, ‘Pool managed 13 shots in the second half, with only two from the visiting side. The telling statistic gleaned from the above however, is that Blackpool failed to force Brad Friedel into a save, not managing to find the target with any of their 13 attempts. Very few of these shots can be classified as clear-cut chances however, as the resolute Villa backline restricted ‘Pool to shots from distance and on other occasions put their bodies on the line to block several attempts. Also visible on the chalkboard is the weekly halfway line attempt from Charlie Adam. It has been said many times that “one of these weeks it’ll come off”, but I’m far from convinced. On this effort Adam surrendered a chance to break in a 3-on-3 situation to indulge in his speculative attempt – Holloway appeared less than impressed with his captain. The red card for Jean Makoun for his two-footed lunge on DJ Campbell once more changed the flow of the game. As already noted by Tangerine Dreaming, this saw Villa revert to a 4-4-1 formation, packing defence and midfield, soaking up the pressure, and using pace to hit on the counter. Blackpool have displayed their inability to shut up shop with eleven men on numerous occasions this season, but this was a shining example of how to do it, even with the numerical disadvantage. The chalkboard below shows Aston Villa’s duels following Makoun’s dismissal. Villa won 20 of their 32 duels after the 70 minute mark, but significantly won almost every tackle in the defensive quarter of the pitch. James Collins in particular was in imperious form, and breaking down the Villa defence proved too difficult a task for a tiring Blackpool. Despite being down to 10 men Villa could have even stolen all three points, looking dangerous when counter-attacking. Whether Holloway might have had more joy from deploying Beattie towards the end remains to be seen, but a final front three of Campbell, Puncheon and Matt Phillips failed to make the crucial breakthrough. On the back of five straight defeats, it was important to get something from this game, but it’s hard not to feel like it was an opportunity missed when playing against 10 men for the final 20 minutes. It was however a performance full of spirit and on another day this Blackpool side would have let slip a late goal. Holloway’s side now have over a week to rest ahead of another home game, this time entertaining Spurs. As the last remaining game in hand, anything from this fixture would be a big boost for the rest of the run-in.